BELLFLOWER, Calif. — The 2015 California quarterback class is "outstanding" according to one recruiting analyst. It’s easily the best group the state has produced in a decade when Mission Viejo’s Mark Sanchez stood atop the 2005 class. It certainly could go down as one of the best in state history. One of the elite signal callers in the 2015 class is staying local. 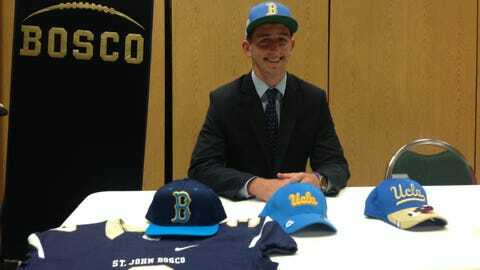 St. John Bosco quarterback Josh Rosen made it official Thursday, officially committing to UCLA during an on-campus press conference. Rosen is the No. 2 quarterback in the nation, according to Scout.com and also second in the state behind St. Bonaventure’s Ricky Town, a USC commit. Rosen’s the fifth commit in the 2015 class for head coach Jim Mora. Last weekend, Rosen says his mind was all but made up when he took an unofficial visit to Michigan. Taking that trip made his decision tougher but he came back assured. "I knew for sure, probably, about four days ago coming back from Michigan," Rosen said. "I came back to L.A. and sort of reassessed where I was but I was pretty confident with my decision." In Westwood, Rosen will have the opportunity to work under the tutelage of UCLA offensive coordinator Noel Mazzone and his son, quarterbacks coach Taylor, who have been lauded for their work with quarterbacks. Taylor’s list of pupils include Robert Griffin III, Christian Ponder, and Tim Tebow as they prepared to make the jump to the NFL. "They’re an incredible father and son duo and I can’t wait for them to take me under their wing," Rosen said. While Jim Mora has received a ton of credit for the resurgence of the UCLA football program, having a top flight quarterback in Brett Hundley has certainly helped in that regard. That’s not lost on Rosen, who’s sat back and watched the current Bruins signal caller and envisioned what he could do as the future signal caller, helping him reach his decision of choosing UCLA. "The success of a quarterback there could probably reflect well on how you could potentially fit in there," Rosen said. The Braves quarterback has a 4.8 grade point average and is working towards graduating from St. John Bosco next fall in order to enroll at UCLA in time for spring practice. UCLA wasn’t the only commitment he made on Thursday. Rosen also announced he will be playing in the Under Armour All-America Game at the end of next season where he hopes to be coached by former San Francisco 49ers head coach Steve Mariucci.